It's late November as I write this, and in the Pacific Northwest, that means rain... more rain... and still more rain. For some reason, this reminded me of Jimi Hendrix and friends playing "Still Rainin', Still Dreamin'" (pretty sure Jimi's youth in the Pacific Northwest had something to do with that song). And once I’d thought about the rain and Jimi’s music, I decided it was time to digitize some LP records. In my first column on Opensource.com, I wrote about the LP record as an open music format. I also briefly described the process for digitizing LP records. Let’s get out the patch cables and open source software and see if we can make it work. First and foremost, in some places it’s apparently not legal to convert a recording from the format in which it was purchased to another format. I’m told this is the case in the UK, for example. My advice? Check your local laws first, and don’t break them. Beyond that, the first thing you'll need is at least one LP record. Keeping on with the Jimi Hendrix theme, I’m going to digitize my pristine re-issue of “Electric Ladyland,” or at least the side containing “Voodoo Child” (not the slight return version—it’s OK too, but I like the long jam recorded with Jack Casady playing bass, Steve Winwood on the organ, and Buddy Miles on drums. There’s a nice comparison with behind-the-scenes info here). The cleaner the record, the better. Really, really clean is really, really great. Dust and grime cause noise—pops and low-level hash—and are hard on the stylus, which is expensive. It’s worth getting decent record-cleaning equipment (I like this one; it’s not too expensive and does a good job, but there are lots of other options). Another possibility is to find a record shop that offers a cleaning service. Most use excellent (and generally unaffordable) equipment, and some even offer de-warping service. There used to be one in my area, but the owner has retired and I haven’t yet found a replacement. $10 to get a warped record spotlessly clean and flat—hard to argue with that. You'll obviously also need a record player (or turntable). Below is a picture of mine, ready to go with “Electric Ladyland” on the platter. My turntable, with Jimi Hendrix's "Electric Ladyland" on the platter. Most decent record players use a pickup, or phono cartridge, that “reads” the groove using a diamond stylus mounted on a cantilever, which acts as an electrical generator, either moving a magnet between some coils, a coil between some magnets, or a small piece of iron between coils and magnets. In the picture above, the phono cartridge is the black object at the end of the tonearm, partially obscuring Jimi’s jaw. The nature of phono cartridges, plus the physical limitations of vinyl as a medium, require that the frequency response of the generated signal be adjusted to restore the natural balance between the lows (Jack Casady’s bass guitar, in this case) and the highs (Buddy Miles’ cymbals). Moreover, the output generated is extremely low-level and requires extra amplification, along with the equalization, in order to bring the signal level up to that of a CD player, digital-analog converter, or other “line level” device. Home stereo equipment built before the '90s generally provided this extra circuitry by way of the phono input, and with the LP record boom, phono inputs are starting to show up on modern equipment too. Those who find themselves without can purchase a special-purpose phono pre-amplifier. Either the outputs of the phono pre-amplifier or the tape outputs (sometimes called recording outputs) of the pre-amplifier, integrated amplifier, or receiver must be connected to the line-in of the computer. Above is a picture of the front of an old pre-amplifier with a built-in phono pre-amplifier. Note the phono setting on the selector switch. Above is a picture of the rear apron of the same pre-amplifier, showing the phono inputs (first two pairs of jacks on the right) and the recording outputs (fifth and sixth pairs of jacks from the right). You can tell that this pre-amplifier was designed in the heyday of tape recorders (both reel-to-reel and cassette)—this is obvious since it needed two sets of recording outputs and two sets of tape inputs. Come to think of it, people were pretty serious about turntables back then, too—this device accommodates two of those as well. Sigh. An alternative that is readily available today is a combination phono pre-amp and USB analog-digital converter. 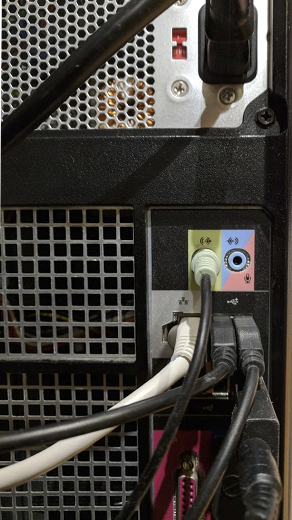 This will bring your equalized phono signals directly to your computer, which could be handy if you don’t have, for example, line-in connections. Some turntables even come fitted with such a device. Of course, you’ll need appropriate cables to hook all this stuff up. Specifically, you need a cable from the recording outputs to the line input. In this case, the cable needs RCA plugs on pre-amplifier end and a stereo mini-plug on the computer end. You also need to be able to plug your turntable into the phono inputs of the pre-amplifier; this is often, but not always, provided with the turntable and ends in RCA plugs. In some cases, the output level of the pre-amplifier is too high for the line-in on the computer. There are various solutions for this problem; I happen to have a pair of these that halve (and a bit) the output level. Last but not least, you need software that provides the recording capability. For this purpose, I use Audacity, a great free and open source tool for audio recording. Using Audacity on your Linux computer is particularly simple since it’s generally available in the repositories for your distribution, but apparently, versions exist for the other two commonly used operating systems as well. Next time, I’ll go through my workflow. But feel free to read the Audacity workflow in the meantime. I’m a huge fan of Massive Attack, and I regularly kick myself for not picking up the “Ritual Spirit” EP when it was on sale at the Vinyl Factory. It’s available at the usual online merchants, but it seems to be running about $100 for a new copy, which is a bit steep. I looked around for a FLAC version, which is apparently available in the UK, but not here in Canada. So I bit the bullet and bought the MP3 version. What! I hear you say, the MP3 version? Yes, I’m afraid so. But I assure you that if it becomes available in FLAC or on LP record for a more reasonable price, I will delete the MP3 from all my computers. Anyway, as far as the music goes—WOW. You can listen, and watch, here (warning: the video might not be suitable for all audiences). Years ago I used a program called gramofile to accomplish this. It's completely command-line, and did a surprisingly good job. Some filters were available to reduce record hiss, pops, etc., and in some ways seemed superior to audacity. I notice it still exists, is still downloadable, though looks like it hasn't had further development for a number of years. The original copyright was 1998. I may try to see if it still compiles. (.wav format) on the harddisk. Now to see if I can check it out -- don't have any LPs or turntable anymore. Thanks for looking at this, Greg. Always good to know there is a terminal window option! Especially one that works well and offers lots of useful capabilities. Chris, Thank you for the Hendrix tunes. What a great way to start the day! Jimi still rocks!!! Thanks for the kind comment, Paul. You are so correct - Jimi still rocks (and yes, it's still raining in Vancouver). A word of advice as far as audio quality. A lot of people that have no understanding of digital audio will tell you to rip your albums at the absolute highest bit depth and sampling rate as possible. If you do that you'll just end up with huge files for no reason. 16/44.1 is going to offer the best bang for your buck. There's a reason why it was used as the CD standard and no other "hi-res" format has really taken off. Especially for ripping vinyl, you could use a higher bit depth but it's not needed as a records dynamic range doesn't come nowhere near 96dB. Anything over 16bit would be overkill and you'd just be filling the extra bits with noise/silence. As far as sampling rate there's little need to go over 44.1 for any audio really, you could go up to 48 to make the antialias filters a little easier but more than likely, all things being equal with a good soundcard/DAC you're not going to notice a difference. The short version is rip your records to 16/44.1 flacs and enjoy high quality audio and small file sizes. Suppose you want to avoid signal overload (clipping) and you're digitizing something with a decent dynamic range. Let's say you decide to keep the peaks below -3dB. And let's remember we're not recording sine waves. And finally, let's remember that when we're recording, we're dealing with the actual signal being laid down, not the "perceived loudness" or other useful indicators of volume levels when we're thinking about other aspects of the chain, like listening. We might find that the quiet spots in a song with decent dynamic range are 50dB below the peaks. So if we're recording with 3dB of headroom above the peaks, we would be -53dB for the quietest parts. Now 53dB corresponds to almost 9 bits of a signal; so a signal at -53dB is being represented by only 7 bits if we're working at a 16 bit resolution, versus 11 if we are working at 20 bits resolution and 15 bits if at 24 bits resolution. 7 bits means only 128 distinct values, thus slightly less than 1% distortion (quantization distortion, I emphasize, not something benign like 2nd harmonic) added by the conversion process. Yes you can use dithering and noise shaping but really it's much easier just to record at 24 bits and forget about all that complexity. As to hi-res formats not taking off, hmmm. They - 24/48, 24/88.2, 24/96 etc, DSD - are quite conspicuous even on such consumer sites as https://ca.7digital.com/ and anyway, "taking off" is not any kind of measure of anything except what certain providers have chosen to provide to their customers. For me, the short version is "always acquire music at the highest resolution possible", so that you're never disappointed by the choice of a crummy format when you upgrade your equipment later. And this includes making digital copies of your precious vinyl! - 3dB is not a good peak value. The nature of digital audio is that "louder" means less distortion with the exception of clipping of course. If I were to rip albums what I would do is find the song with the highest peak and set the gain so that highest peak was 0dB (or -0.1dB if you're scared of 0) for the entire album. You'd be lucky to get an actual noise floor of -53dB with *average turntable + phono preamp + off the shelf soundcard*. Your -53dB passage will most likely be under or right at the noise floor. In any event a useful tool for lowering the noise floor after ripping is a downward expander. Jason, thanks again for your comment. "-3dB is not a good peak value. The nature of digital audio is that 'louder' means less distortion"
This is precisely my point as to why it's a good idea to record at 24 rather than 16 bits, in which case -3dB is a great peak value, leaving plenty of dynamic range and not forcing us up against the absolute maximum. "You'd be lucky to get an actual noise floor of -53dB with 'average turntable + phono preamp + off the shelf soundcard'"
indicates its signal/noise ratio is -70dB. 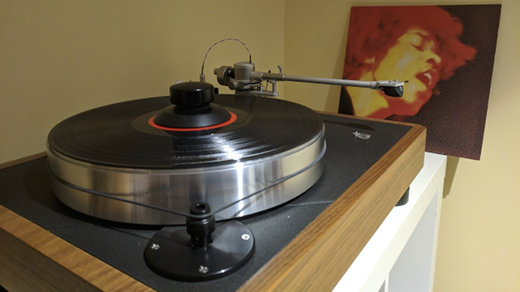 Moreover, it's my experience at least that turntable noise tends to occur mostly in the lowest frequencies (rumble) - I've never used a turntable that introduced broad spectrum noise the way electronics does. which also claims the average built-in sound card has a signal/noise ratio of -85dB. In any case, the record surface noise also has a lot to do with this matter. And it's easy to determine for yourself that music is still audible through record surface noise. Anyway, I'll come back to my original statement - if you want to archive your ripped LPs at 44.1/16 (or even Ogg or MP3), go right ahead. But please record them at the full resolution given by your sound card, allowing a bit extra to avoid any clipping artefacts, and convert them afterward. Just a coda to this; the February Stereophile magazine, in its review of the MBL Noble Line N31, mentions this issue of intersample overs and that device's ability to cope with such a thing, identifying "multiple instances of consecutive samples at 0dBFS that would result in intersample overs" (stereophile.com February 2018 page 81). So recording with peaks at 0dBFS - definitely not recommended.